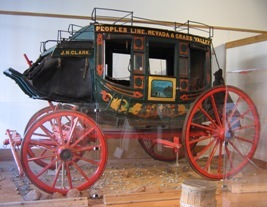 July 1 to November 1 – Rolling Through the West was an exhibit presented by the Santa Ynez Valley Historical Museum, 3596 Sagunto Street, Santa Ynez, Calif. 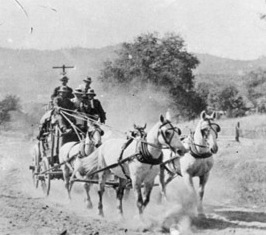 The museum’s exhibit offered an historical photographic look at stagecoaches in the Santa Ynez Valley and Santa Barbara areas with a perspective on the history of the stagecoach, its construction and influence on the American West and California. 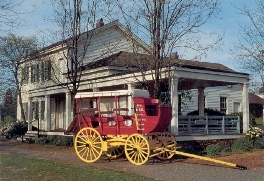 The museum is home to the renowned Parks-Janeway Carriage House and its extensive collection of outstanding carriages, saddles and horse-related gear. 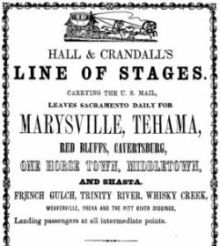 August 9 & 10 – The Heritage Trail was presented by Placer County museums. Visitors were able to trek back in time along Placer County’s museum trail. For this special occasion, admissions were free to travelers visiting all 18 participating museums, from Roseville to Tahoe. Everyone learned about events that made Placer County’s past so colorful. 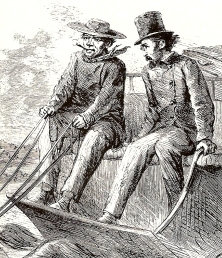 They included the Gold Rush, construction of the First Transcontinental Railroad and developing winter sports, like skiing. A Trail Guide was available at every museum, listing the attractions, activities, and driving directions. 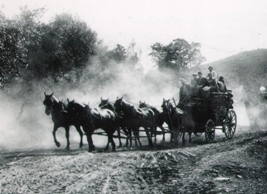 Mud wagon stages that once served the Placer County gold mining communities in the late 1800s can be seen in Auburn. The No. 1 Colfax, Yankee Jim & Forest Hill Stage is on view at the Placer County Museum in the Historic Courthouse and the Colfax & Iowa Hill Stage No. 2 is in the carriage barn at the Bernhard Museum Complex. at Bodie State Historic Park. Visitors to the historic mining ghost town of Bodie and saw an important destination for stages. There was a special BBQ, as well as tours and talks with the Friends of Bodie. From U.S. 395 seven miles south of Bridgeport, take State Route 270. Go east 10 miles to the end of the pavement and continue 3 miles more on an unsurfaced road to Bodie. Sponsored by Bodie State Historic Park, the Friends of Bodie and the Sierra State Parks Foundation. at William B. Ide Adobe State Historic Park. Attendees learned more about stage travel and witnessed a tug of war between the competing stage companies, Baxter & Co. and Hall & Crandall Stage Line. Everyone enjoyed the Ide AdobePlayers’ music and experienced “hands-on” pioneer crafts at this historic ranch and ferry crossing. The park is two miles northeast of Red Bluff off I-5 on Adobe Road. Sponsored by William B. Ide Adobe State Historic Park and the Ide Adobe Interpretive Association. at Old Town San Diego State Historic Park. Visitors became part of the frontier experience of historic Old Town. There was a wagon ride, period activities, games and music. 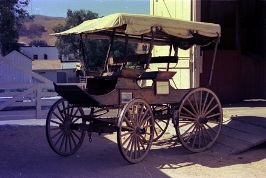 Attendees saw an authentic Concord stagecoach at Wells Fargo Bank’s museum in the Colorado House and a historic mud wagon and celerity coach used on California’s stage roads exhibited at Seeley Stable. A special "Stagecoach Days 2008 Dinner" under the stars was be held in the Plaza on Saturday, August 23rd at 5 pm. The park is located on San Diego Avenue and Twiggs Street in San Diego, and is convenient to the Old Town Transit Center, with Coaster, Trolley, and MTS Bus service. Sponsored by Old Town San Diego State Historic Park, Slow Food San Diego and the Boosters of Old Town San Diego. Old Sacramento Historic District and Old Sacramento State Historic Park. 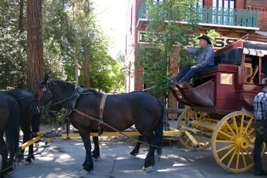 Here attendees saw history come alive on the dirt streets of Old Sacramento—only horse-drawn vehicles allowed! 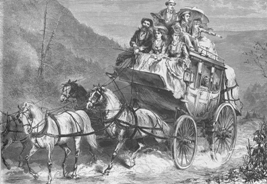 You could have your picture taken on board a Wells Fargo stagecoach. Everyone captured the past through parades, living history, demonstrations, music, entertainment, and other offerings representing Sacramento’s early years. The historic district is adjacent to downtown Sacramento next to Interstate 5. Covered parking was found nearby in several multi-story parking structures. at San Juan Bautista State Historic Park. Vistors could step back to the early days of San Juan. 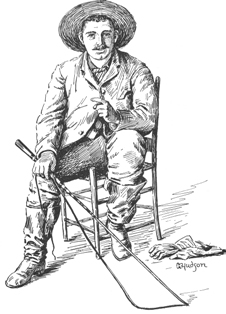 Meet mountain men, Civil War soldiers, Victorian ladies, and stage driver “Charley” Parkhurst, who had a secret. They enjoyed craft and cooking demonstrations and an old-fashioned soda in the historic Plaza Hotel Saloon. There were historic horse-drawn vehicles inside the Plaza Stables. 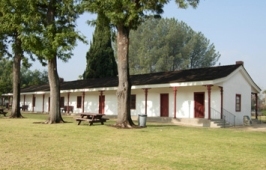 The Park is located on Second Street, between Washington and Mariposa Streets In the city of San Juan Bautista, 3 miles east of Highway 101; 7 miles west of Hollister. Sponsored by San Juan Bautista State Historic Park and the Plaza History Association. at Columbia State Historic Park. The "Gem of the Southern Mines" came to life with volunteers in period attire, special tours, and historic activities, including stagecoach rides, period bowling (yes! ), a fire bucket brigade, concert by the Great Motherlode Brass and Reed Band and special children’s activities. Columbia State Historic Park is three miles north of Sonora, off Highway 49. September 13 – Stagecoach Day at Chino Hills State Park There were all day events. 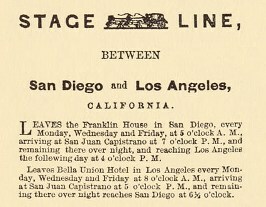 On the original route of the Butterfield Overland Mail Stage, visitors could envision the joys and misery of stage travel. The park is located 10 miles northwest of Corona. Take the 91-Freeway to Highway 71-North, turn left at Soquel Canyon. Proceed to Elinvar and turn left. Elinvar merges into Sapphire on the left. The park entrance is on the right. Sponsored by Chino Hills State Park. September 20 – Stagecoach Days at Las Flores Adobe Visitors saw the historic circa 1860s two-story Las Flores Adobe National Historic Landmark on Seeley Stage line’s San Diego to Los Angeles route. They enjoyed guided tours, horse rides, demonstrations, music, and visit period encampments. Period attire was encouraged. There were free access tickets to get onto Marine Corps Base Camp Pendleton. Sponsored by the Rancho Santa Margarita y Las Flores Docents. 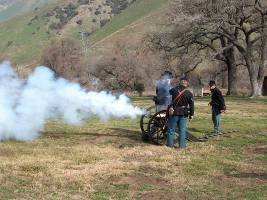 October 4 – Stagecoach Days Celebration at Fort Tejon State Historic Park. Fort Tejon came alive with the arrival of the Butterfield Overland Mail Stage. Volunteers in period attire celebrated the arrival of the first stage with special tours, cannon firing and historic activities. Visitors could meet mountain men, Army soldiers, Victorian ladies, gamblers and stage drivers. You could try games of chance in the casino. A period baseball game was held along with a pie-eating contest! Fort Tejon State Historic Park is located on Interstate 5, just north of Lebec, about 36 miles south of Bakersfield and 77 miles north of Los Angeles. at San Juan Bautista State Historic Park. Visitors could step back to the early days of San Juan and meet mountain men, Civil War soldiers, Victorian ladies, and stage driver “Charlie” Parkhurst, who has a secret. They enjoyed craft and cooking demonstrations and an old-fashioned soda in the historic Plaza Hotel Saloon. Also you saw historic horse-drawn vehicles inside the Plaza Stables. The Park is located on Second Street, between Washington and Mariposa Streets In the city of San Juan Bautista, 3 miles east of Highway 101; 7 miles west of Hollister. Sponsored by San Juan Bautista State Historic Park and the Plaza History Association. October 4 - California Archives Month Open House at the California State Archives. 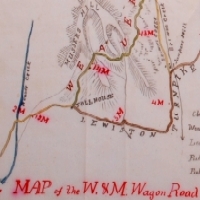 Attendees could view historic maps of early stagecoach and wagon routes including the Lake Tahoe Wagon Road, the San Bruno Turnpike Road, the Weaverville and Minersville Wagon Road, and the stage road between Oroville and Marysville. 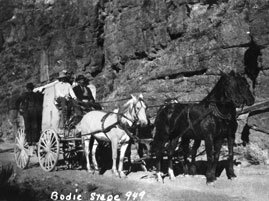 They saw materials relating to California stagecoach robberie and enjoyed guided tours behind the scenes of the State Archives. The Archives is two blocks from the State Capitol, 1020 O Street. 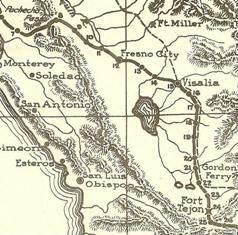 October 11 – On the Butterfield Stage Route Through Tulare County. Attendees took a road trip from the foothills to the tules, revisiting the original route of the Butterfield Overland Stage on an escorted car caravan. Local historians offered presentations at the different stops. Refreshments were offered, but participants were advised to bring lunches and water. The event was Free. Sponsored by the Tulare County Historical Society. at Shasta State Historic Park. The “Queen City of the Northern Mines” came to life through special guided tours and exhibits. At the head of “Whoa! Navigation,” the town’s colorful history encompasses many stage companies. The Pioneer Barn houses a restored stagecoach and a stone monument celebrates stage drivers. The park is six miles west of downtown Redding. Highway 299 passes through the town’s main street. Sponsored by Shasta State Historic Park. October 11 – Western Hoedown At Las Flores Adobe. Visitors enjoyed a real Western Bar-B-Que, Western music, Barn Dance, and Silent Auction. Attendees also enjoyed guided tours of the1860s Las Flores Adobe National Historic Landmark, demonstrations by the Code of the West, and tall tales from the Seeley stage run between San Diego and Los Angeles. Sponsored by Camp Pendleton Historic Society. October 11, 12, & 13 – Coloma Gold Rush Live at Marshall Gold Discovery State Historic Park. The historic Gold Rush tent town of Coloma came to life for three days. You could enjoy living history, demonstrations, carriage rides, and gold panning, or take a ride on a carriage, or watch miners at work. 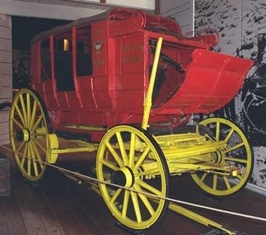 Visitors saw an original Concord stage coach on exhibit in the museum. The park is located in Coloma on Highway 49 between Placerville and Auburn. Sponsored by Marshall Gold Discovery State Historic Park and the Gold Discovery Park Association. at Los Encinos State Historic Park. Rancho El Encino’s natural spring helped to support the Butterfield Overland Mail as a station stop. 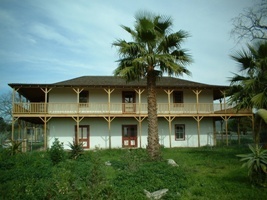 Attendees could take a tour of the original adobe that stagecoach guests visited and enjoyed living history in the park. The day was scheduled to include smithy demonstrations, food to share, games and activities for the kids, singing and other fun. Follow the 101 Ventura Freeway to the Balboa off ramp. Turn south on Balboa to Moorpark (one block before Ventura Blvd.). Turn left onto Moorpark and park on the street. Enter through the gate. Sponsored by Los Encinos State Historic Park and the Los Encinos Docent Association. October 28 – California Stage Drivers – 7 p.m.
Gary Kurutz, Director of California State Library’s Special Collections, author and editor of Knights of the Lash, offered a special lecture on California’s noted stage drivers.